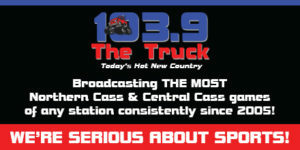 Live Sports | 103.9 \"The Truck\"
Live Sports Broadcasts…With Brad Anderson!! Class B ND High School Sports with Award-Winning Sports Announcer Brad Anderson! Central Cass, Northern Cass, Enderlin, Maple Valley, Kindred, Richland, Oak Grove, Lisbon, Milnor, North Sargent, Sargent Central, Hankinson, Oakes, Wyndmere-Lidgerwood, Wahpeton & Finley/Sharon-Hope/Page. *Listen HERE for LIVE STREAMING.